Outpost by St Ali is the brand new South Yarra outpost of cult specialty coffee house St Ali (read about my St Ali coffee cupping adventures with Slightly Intense Thirty-Something Metrosexuals here). Hyper-confusingly, the address for the Outpost by St Ali is Yarra Street, South Yarra, and the address for the original St Ali is Yarra Place, South Melbourne. Not to be confused with Yarra Street in South Melbourne. Too many Yarras! Too many Souths! Outpost by St Ali opened last Monday on the ground floor of a big new commercial/residential development, down a side street next to South Yarra train station. Current opening hours are Monday to Friday, just during the day. No weekends now 7 days a week, but just during the daytime. They're still awaiting chairs and tables, a phone and a proper food menu. The oven was delivered yesterday, and the domestic dishwasher will eventually be replaced by a commercial one. I dropped in there this week with two other food bloggers, Jackie from Eating with Jack and Matt from Abstract Gourmet, currently over here from Perth for a week sampling the best Melbourne's food scene has to offer. Bloody food bloggers, always taking photos! That's Matt taking photos, and Jack on the right twittering about how Matt and I are taking photos. 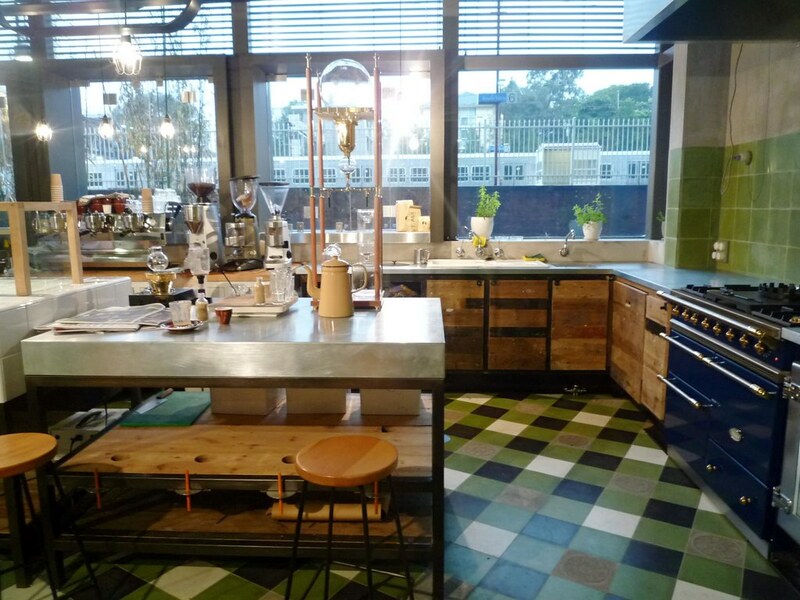 The plan is to introduce a simple menu (smaller than that at St Ali) of food that can be prepared in the oven, in addition to the smattering of pastries and rolls currently on offer. An outdoor seating area will follow. 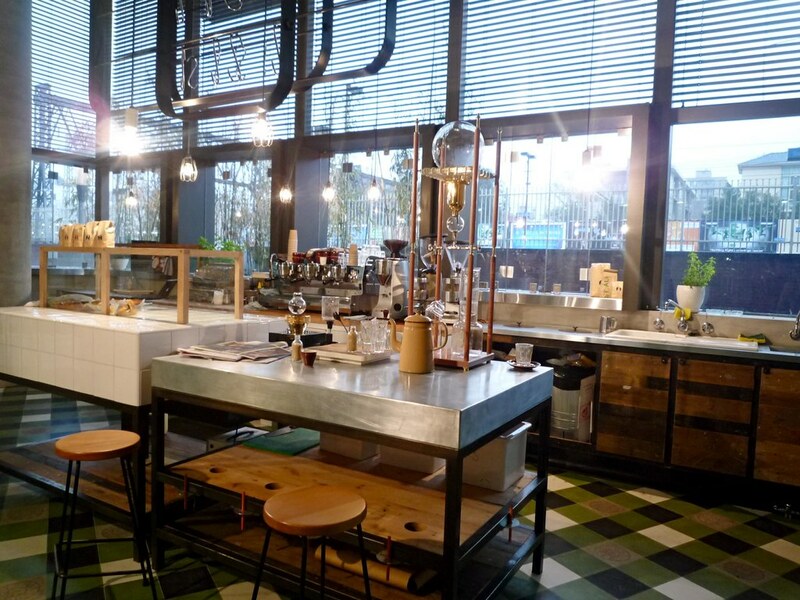 For now though, the emphasis is very much on educating people about specialty coffee - the stylish school science lab interior certainly helps! Jack and I just LOVED that matte tiled floor. 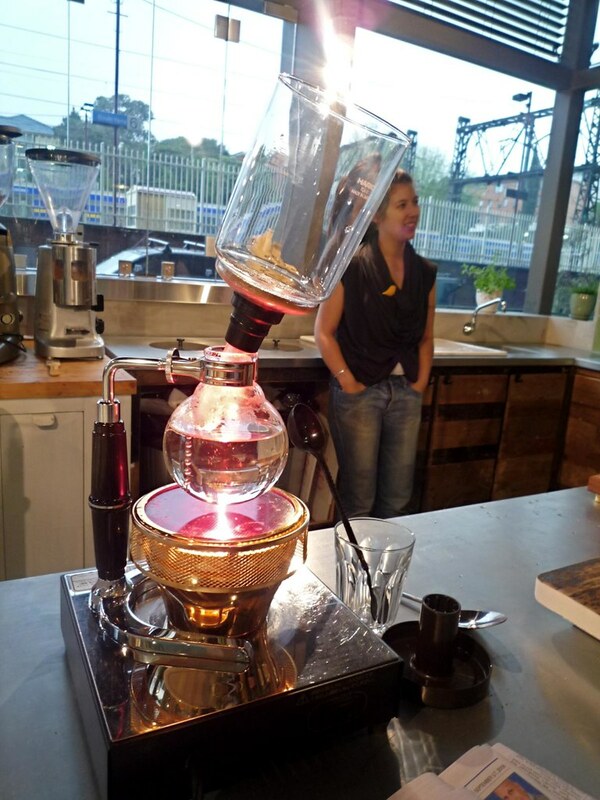 The siphon coffee maker (below), being heated by an eerie bright red halogen lamp. I recognised Aaron, our barista, from his days at Auction Rooms. He showed us around, talked coffee geek technical talk with Matt, and gave me a taste of my first ever cold drip coffee (made using that gorgeous, steampunk-esque cold drip machine pictured below). My siphon coffee and cold drip coffee side by side. Loved both. 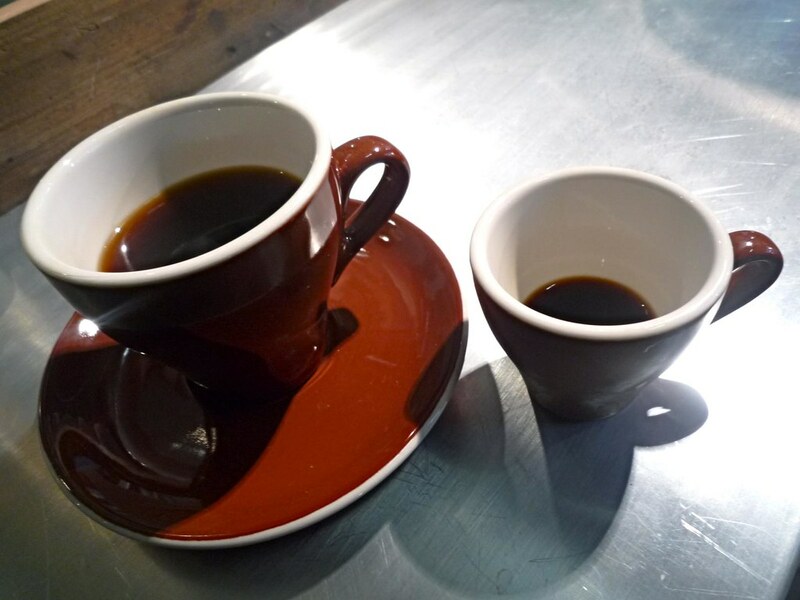 I was amazed by how light and sweet the cold drip was in particular. Speaking of steampunk, how cool (albeit no doubt somewhat inconvenient in this day and age) is that antique cash register? 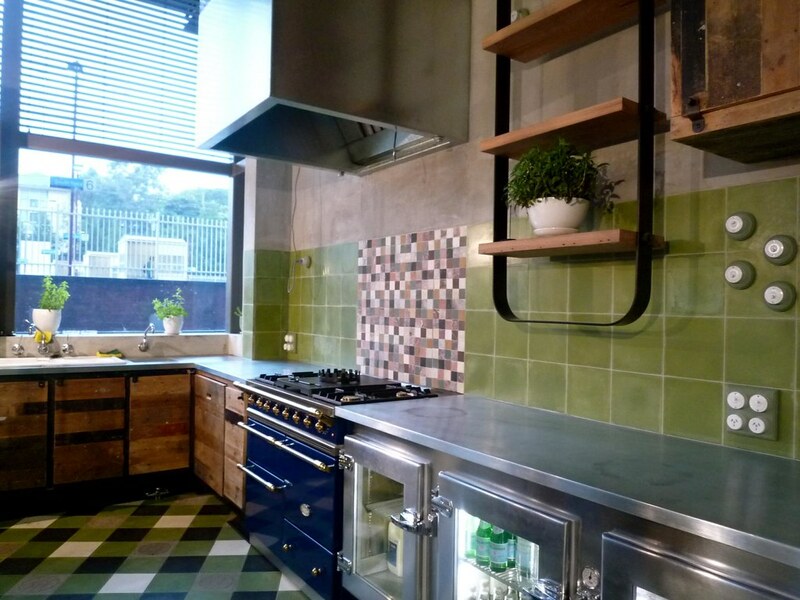 The fresh herbs dotted about the room was another nice touch. 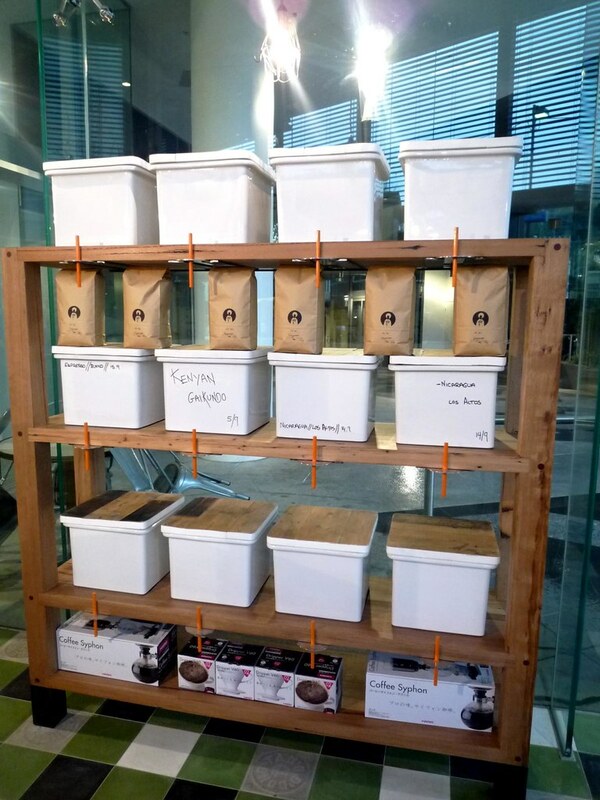 Oh and as you'd expect, plenty of single origin coffees (including beans sourced directly by St Ali rather than through a middleman). Head there soon and check it out for yourself before everybody finds out about it! 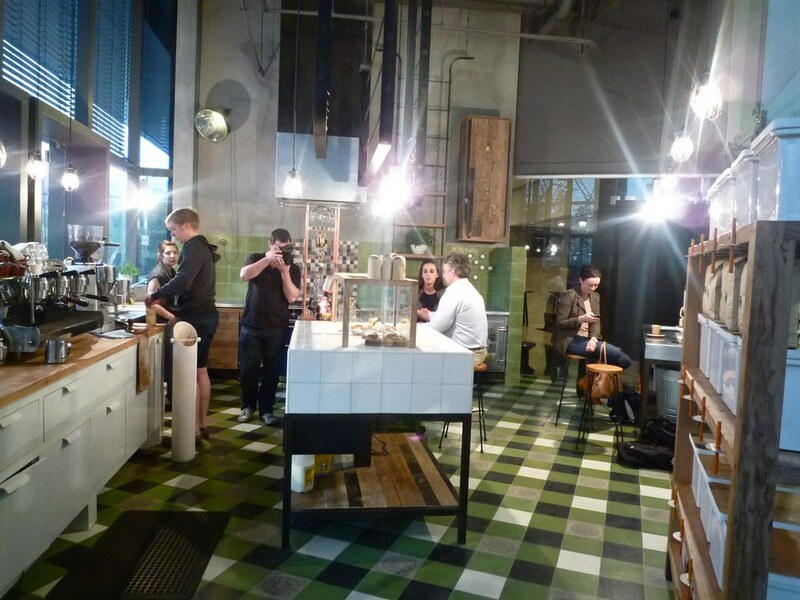 Hear ye, hear ye: as of this weekend, Outpost by St Ali is now open 7 days a week. Paul Jewson, the chef who started on Monday, is already whipping up some very interesting-looking dishes with the assistance of that gorgeous oven! Wow what a cool place! 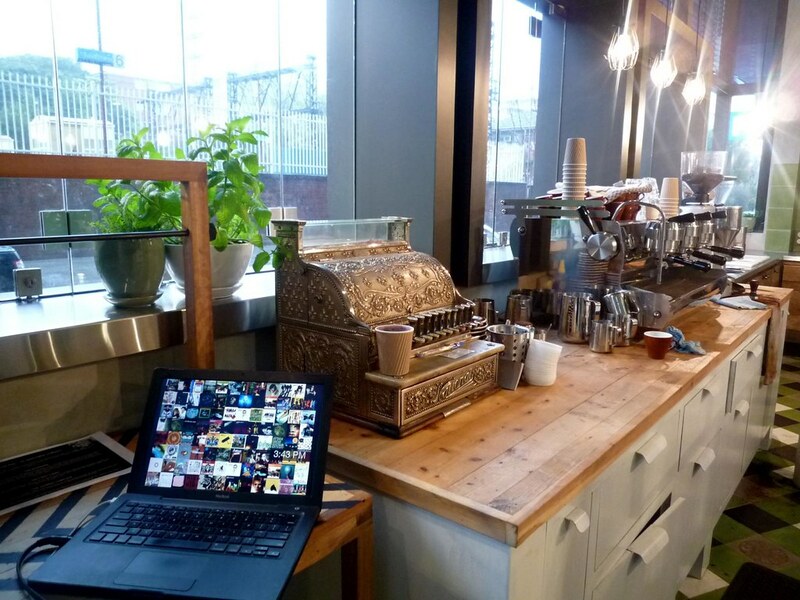 Love the steampunk coffee machine! 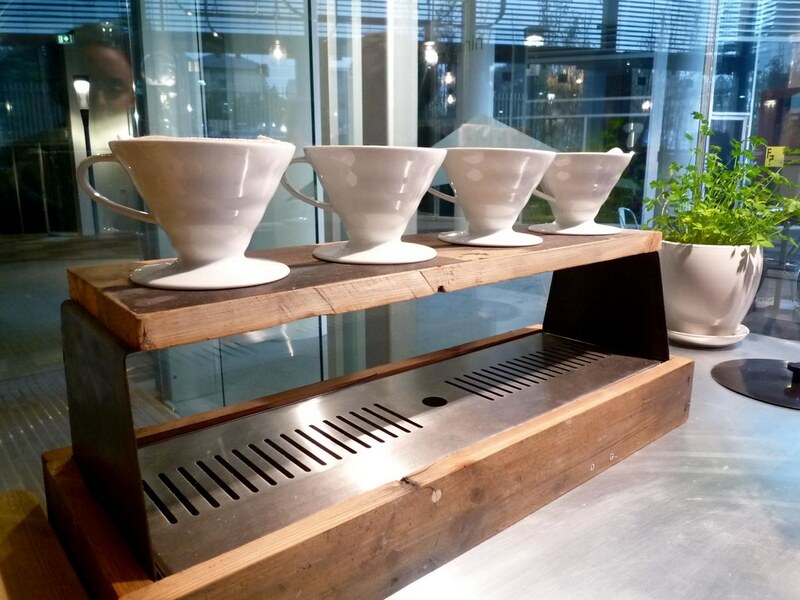 Looks awesome - any other reviews on the coffee/roasts? Did a brief review of Seven Seeds on my blog - go there regularly - will have to drop by south yarra though! Look at those great cups of joe. Huh. I sort of agree with you about your take on the interior, Brett... but I also really like it. Nope Brad, no other reviews on the coffee/roasts from me. I'm afraid I'm still a coffee neophyte. 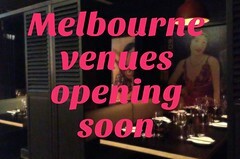 But Matt from Abstract Gourmet will probably be covering it in his Melbourne posts - and he knows way more about coffee! Speaking of coffee - go to Little Wish opposite Bambini Barrista. Seven Seeds beans, Koko Deluxe hot chocolate, home-made bread (for toast), 95c tiny muffins, sweetest couple who run it. great coffee in an area that has more crap coffee than not. I can't stand coffee, but I'm almost temtped to give this a try. ooooohhhhh, I heard this place was opening...its here! YAY! Thanks so much, I discover this place through your blog and had a coffee there this morning. Amazing, loved the atmosphere! !It's apparently on Epicure today, argh no!!! The coffee rocks and the food is excellent! Great variation of ingredients and great roasts and delicious salads. Simply magnificent food. It was the best meal for a long time. Brilliant breakfast menu too. Cant wait to go back next saturday for more food and coffee. The place its cosy but brilliantly designed. 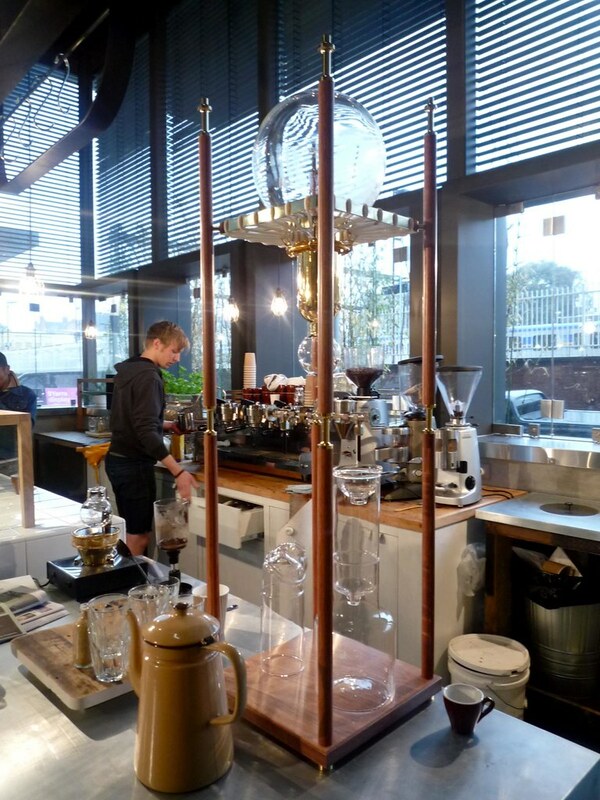 Must try the coffee made with a syphon, it was just amazing. 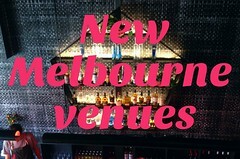 It was about time to have something so original in South Yarra! Very chilled atmosphere and very friendly staff. Dont miss outpost it rocks!!! Guys...you don't have the foggest idea of how lucky you are to have Paul Jewson as a chef at hand!!! I met him long time ago in London and followed religiously his moving from place to place. I just could not miss his food as you wouldl do for a mystic experience of your life. a table... It's not just about food, it's about LOVE!